Made in 1930, Griffith's Abraham Lincoln was director's penultimate film in a movie-making career that lasted from 1908 to 1931. This was Griffith's first attempt at making a 'talkie', a format he had previously scorned. The movie seems to have been both an attempt to regain his previous glory as a director and to prove that he could cope with the technological innovation of sound. But Lincoln was tepidly received by critics and audiences. By now heavily alcoholic, disillusioned and shattered by the erosion of his cinematic abilities, Griffith made only one more film. He spent the next decade unsuccessfully trying to get studio backing for more movies. Griffith died in 1948, in poverty, forgotten by many in Hollywood, his films unknown to new generations of movie-goers. 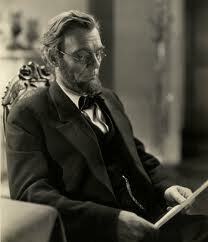 WHAT'S GRIFFITH'S TAKE ON LINCOLN IN HIS FILM? Most contemporary verdicts on Abraham Lincoln use phrases such as 'uneven' and 'not without merit'. His use of talkies technology is also regarded as not particularly successful.While the movie lacks the cinematic and emotional impact of his earlier masterpieces such as Birth of a Nation and Intolerance, it remains moving and interest. Always one to take enormous risks, Griffiths and his screenwriter Stephen Vincent Benet (Pulitzer Prise winning poet and author) decided to make a movie about all of Lincoln's life and times, from childhood to death - an impossible task, given that Lincoln's life was so crammed with significant personal and public events. Consequently, the first section of the film focuses on certain excerpts of Lincoln's early life, including his humble origins, and his days as a young lawyer,and becomes more detailed once Lincoln becomes a national figure. 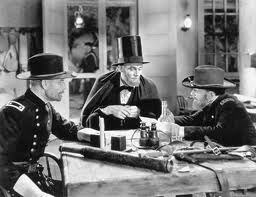 Apart from the role it plays in Griffith's movie career, the main significance of his Lincoln movie is that it provides a template for screen portrayals of Lincoln. In his role as the President, Walter Huston (father of director John Huston, grandfather of actor Danny Huston) delineates the image of Lincoln that we have now come to take for granted. Huston's Lincoln combines sternness with a sense of irony and humor. He has integrity and fortitude, but is burdened by depression and, having become President, an overwhelming sense of responsibility. What is particularly impressive about Huston's performance is the way he portrays the Lincoln as a young lawyer and husband, and emerging statesman - we can sense the qualities of greatness in embryonic form. The director focuses on one interesting aspect of Lincoln's character: his strong-willed determination, especially his determination to preserve the Union from disintegration. But Griffith ignores another aspect of Lincoln's determination in his final period as President - his insistence that the conflict must result in the abolition of slavery. Griffith's generous take on Lincoln -prefigured by his depiction of the president as martyr in his earlier Birth of a Nation - is rather surprising since Griffith's father was a wounded Confederate soldier. Griffith's glorification of southern values in that film, and its blatant racism, also mean that his respectful treatment of Lincoln is rather unexpected. However, for all its racism, Birth of a Nation's famous sequence depicting the assassination of Lincoln had helped confirm the image of Lincoln as martyr. Griffith's version of Lincoln also insists that his intention that the Confederacy not be the target of vindictive punishment by the victorious North was a quality of surpassing merit. These images from the movie established some of the abiding features of movie depictions of Lincoln: the hardworking, rail-splitting pioneer, the leader burdened with responsibilities, the dignified, contemplative visionary. Griffith (right) working on set with Billy Bitzer. "I made them see, didn't I? I changed everything." Griffith (with the help of his great cameraman, Billy Bitzer) revolutionized film-making by his innovations such as parallel editing and flashbacks, use of split-screen, the mask and the iris shot. His greatest films displayed an almost unequaled ability to combine grandeur and spectacle with intimate depictions of emotional turmoil and provocative social and political commentary. He had the insight to understand that films need not be confined to one reel (15 minutes) in length, that in fact audiences were more than happy to watch movies one two, three hours long. He also realized that cinema could be both a popular entertainment and an art form. Born in 1875 to a southern family, he spent some years as a stage actor and would-be playwright. Eventually he turned to acting in movies, Before long he became a director at Biograpah Studios, working with Billy Bitzer. Griffith eventually made more than 400 short films for Biograph. These included several movies e.g. 1909's A Corner in Wheat (about predatory capitalism) that showed his remarkable ability to combine penetrating comment about social issues with innovatory style, narrative tension and emotional impact. Birth of a Nation, about the Civil War, following it the next year with Intolerance which combined four separate narratives and eras in one gigantic epic. Several more box-office and critical hits followed during that decade, including Hearts of the World (which he reissued in the first ever director's version) and Broken Blossoms. But during the 1920s Griffith's career faltered. His Victorian sensibilities, which focused on the melodramatic, the didactic and the sentimental now seemed mawkish and old-fashioned. His view of women as essentially innocent and passive was out of tune with the decade's media portrayal of females as daring, trend-setting and independent. Griffith was forced to return to working for a big studio, Paramount,where his ambitious projects and maverick streak received little sympathy. His last film was made in 1931. For the next 15 years he tried unsuccessfully to bring his ideas to screen. Alcoholic, poverty-stricken, lonely, Griffith died in a cheap Hollywood hotel in 1948. This is a scene from one of Griffith's 'short' films, 'Musketeers of Pig Alley', made in 1912. It was the first movie ever made about gangsters. Griffith shot this scene and others on location in a New York tenement area, using locals as extras. (Lilian Gish is the actress at left) Although the film is a century old, it still looks remarkably modern.